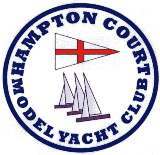 Despite a dreadful weather forecast, conditions proved to be much better than expected for the 12 skippers who sailed in the R36 National Championship held at Hampton Court MYC on Saturday 11th October. A moderate breeze, although somewhat variable, enabled a testing course to be set with plenty of beats. Unfortunately, an early casualty was Chris Harris who had to retire in the first race with winch trouble only to find that his winch had burned out and his day’s sailing was therefore at an end – very bad luck indeed. 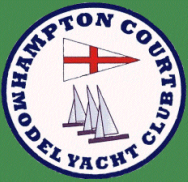 It was soon clear that Dave Andrews (HCMYC) was setting the pace with 5 wins out of the first 6 races with Vernon Appleton (Coalhouse Fort), Colin Trower (HCMYC) and Alan Maynard (Solent) fighting it out for second place some way behind. Following lunch, during which we had the only rain of the day, Vernon began to pull away from Colin and Alan but his efforts to catch Dave were hampered by a gear failure which prevented him completing race 11. At the end of the day’s racing, the clear winner was Dave Andrews (20pts) with Vernon Appleton second (26pts) and Colin Trower third (42pts). My grateful thanks go to the Race Team (Mike Stroud, Peter Smith, Tom Davies, Colin Boulding, Mike Watkin, Julia Hancock and Alan Oxlade) whose hard work contributed greatly to a successful day.